For enlarged view, please click on the scoreboard. Got QRV in the work parking lot. Set up a homebrew end fed half wave antenna, for 20m and managed one contact. Had to get back to work, so I was happy. This was my first entry in about 5 years. I wanted to exercise my KX3 somewhat. The only active band was 20M, only 1 Q on 40M. There is a big opportunity for weight reduction. Thanks to all for the contacts. Haven't been on for the SP in quite a while. Decent band conditions on 20. Was fun! K3/10 @ 5W to 15 and 20M delta loops, a 40M dipole or a 40M EDZepp. 14 states this month - including all four corners of the lower 48. NQ2W was rolling in on 15M but that was it. Had 1 on 15M, 14 on 20M, 8 on 40M and 2 on 80M. This was my first time to work sprinters with 1, 2, 3, 4 and 5W. Some new calls too! My thanks to all. Had fun . . . Very good conditions on 20M and 40M. Some very strong signals on 40M. Usual set up. HB1B @ 4 watts; T1 tuner ; 850mah lipo and palm paddle. Only ran about 1 hour. Had 13 contacts. Only had 2 from MD. for the New England area. Worked MO, TX, FL, GA, CA, MS, and Washington State. Worked Don ,K3RLL, in FL. with his Mountain Top radio @ 3 watts. Nice signal ! I should have mine ready to go for the next SP. TINY radio. Talk about soldering small parts! Also very nice work for Gene, N5GW, from Mississippi with his BIG 1 watt. All the best to everyone. Had alot of fun! K1 at 5 W to a 2-element mini-beam at 25 ft for 10, 15, and 20 meters and an inverted V at 40 ft for 40m. My homebrew paddle reverted back to its old, even though it's only a few months new, self ... perhaps I need to use it more than once a month! I apologize for the rough sending. I started out on 15 m and was able work NIck, WB5BKL, with a strong signal. Moved to 20 for 15 more including one with WB5BKL. Then on to 40 for 7 more. For the most part, signals were FB. Have fun during FD. Hopefully, see you all next month. K1 to stealth vertical: How nice to see 20 meters stay open so late. Many thanks to those who came back to my steadily diminishing signal tonight as my small battery continued a slow and painful death. Appreciate the contacts with both new and very familiar calls. ATS-3. 20M: Audio very low hard to hear some stations. N6XG loud.40M: Could not pull out a couple of stations. Ran the KD1JV TRI-BANDER. All the weight in the SLA battery. GREAT FUN. It was really great to spend some time on 20M this month. 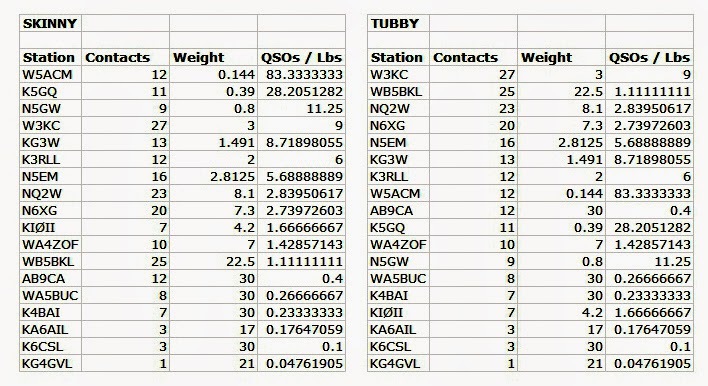 QSOs on 20 were as close as N5EM in West Houston to W1PID in NH, N6XG and AA6GI in CA and W7OM in WA. I still have a small issue with 40M reception and the contacts on the keyer paddle. I will keep working on the paddle contacts. The two 200 mAh LiPo batteries did quite well, but the power output with a nominal 7.4 VDC is 3 Watts, and started dropping just after the first hour. I was probably around 2 Watts while working W3KC, WA3FAE, NQ2W and WB5BKL on 40M. Congrats to them and their receivers! Better results this month. 20 and 40 were productive tonight. Got to put new stations in the log along with old friends - always a good thing. Where did everyone go? I was a few min late getting started but 20 seemed fairly active, 10 Q's in about 20 min. It got slow after that so went to 40. No one seemed to be there. Worked 2 contacts in about 25 min. I had only an hour so had to drop out after that. Hope others found more activity than I was able to scare up. Rig was K2 at 5w to 100' wire. Hope to see everyone (and a few more) next month! Enjoyed the Sprint - band conditions were favorable. Got a big grin when QRP'er Rumi LZ2RS answered my CQ SP on 20m. Used the IC703 and a 90 ft doublet at 24 ft.
As usual I started on 10m and found nothing there. I heard a couple if stations on 15m, but couldn't get them. Went to 20m where found KI0II(tnx). Before I left 20 for 40m I tuned down caught W1AW/0 in MO. He was QRO but heard my 5W on the 1st call. I moved to 40m at 02:30Z. 40 was quite noisy from lightning storms up near the CA/OR border. I heard several QRP stations there, but couldn't seem to work them. I settled for a brief QSO with KB6VSE, Steve, in Benbow, CA up in Humboldt County, CA just south of Eureka, CA, near where the evening Thunder Storms were occurring. H e was also QRO but answered my 5 watts on the 1st call. So that's the story from the northern San Joaquin Valley. I was using my 1.5 watt homebrew 20M xcvr, the "Sprite" on an 800 mAh LIPO to a homebrew tuner and CFZ. The rig and tuner are built into a clear plastic cas, with a microkey on the side, containing an N0XAS picokeyer. Looks like a rat nest but works OK. TX is rockbound, but I have three rocks. The DC RX is not the best, as it is not a single signal type, but if the overload from nearby AM stations is not too bad, I can work a few of you QRPers. Got home and got the antennas and rig hooked up with just eight minutes left in the Sprint. A quick look at 20M showed no signals near 14060. Only one ragchew evident near 7040, but CQs brought six quick QSOs (MD, PA, TX, NY). QSY to 3560 with one minute to go and worked a strong WB5BKL in TX. Sorry to miss many of you, but glad to get on for the end. Looking forward to full participation next month.